Korean chopsticks are unique. There is a huge difference between chopsticks from Korean and other Asian countries. Unlike China, Japan, Vietnam and Thailand whose chopsticks are primarily made of wood and bamboo, Korean chopsticks are made traditionally of iron and today of stainless steel. Korean chop sticks are also flat, like the handle of a western fork or spoon rather than round or square like other Asian cultures. In addition, Koreans use a spoon much resembling a western spoon, along with their chopsticks. Koreans have a long history of excelling in metalworks. 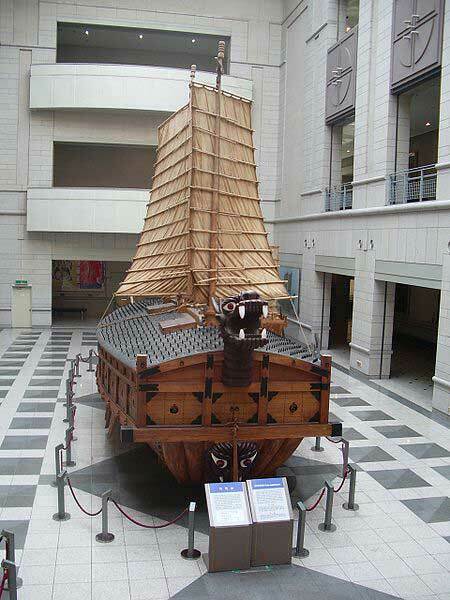 In the Japanese invasion of Korea in 1592 the Korean navy successfully used their Geobukseon or Turtle Ships, a warship made with a metal covering protecting soldiers from arrow and musket fire and metal spikes to deter boarding. Today Korea is one of the world's largest and best manufacturers of ships. Another example of their early metal technology is a book called 'Jikji' stored at the National Library of France. It is the earliest known book to be printed with metal movable type, preceding the Gutenberg press by more than 200 years. Indeed metal chopsticks are far more durable than wood or bamboo chopsticks. 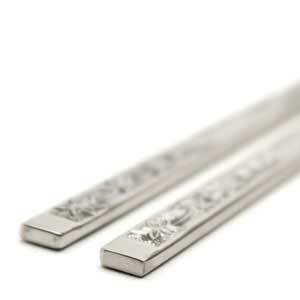 Like western silverware metal chopsticks can last a lifetime with proper care. Since Korean chopsticks are thinner, heavier and slipperier than other styles of chopsticks, parents must use more patience in teaching their children in chopsticks use. Korea is known as the 'Eastern country of good manners.' Korean chopstick manners vary slightly from other cultures. For instance, unlike in China, it is not proper to lift your bowl of rice to scoop the rice into your mouth. Children are taught at an early age to hold their chopsticks properly and to wait until the senior adult begins to eat before beginning their meal. There has been a recent influx of tubular stainless steel chopsticks made in China referred to as Korean style chopsticks, but that is untrue. Though excellent chopsticks, those are made to a Japanese style and shape even though traditional Japanese shy away from using non-natural material chopsticks. True Korean chop sticks are flat, but despite their diminutive size and thickness they weight considerably more than other types of chopsticks. You can find several styles of Korean chopsticks for sale online at EverythingChopsticks.com. There you'll find both Korean chopsticks by the pair and Korean chopstick and spoon sets. 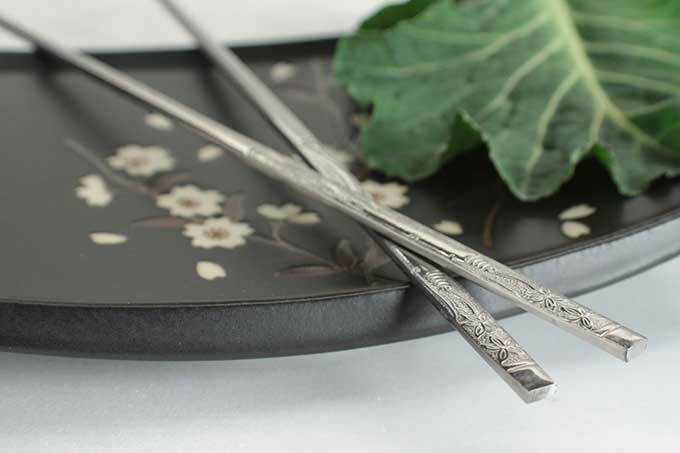 For those unfamiliar with eating with metal chopsticks see our blog post article ' What's it Like to Use Metal Chopsticks? '.